Trevor Paglen: The Man Making Art From Government Surveillance Trevor Paglen thinks about being monitored by things you can't see: secret military bases, tapped cables, spy satellites. So he just sent a work of art into space. 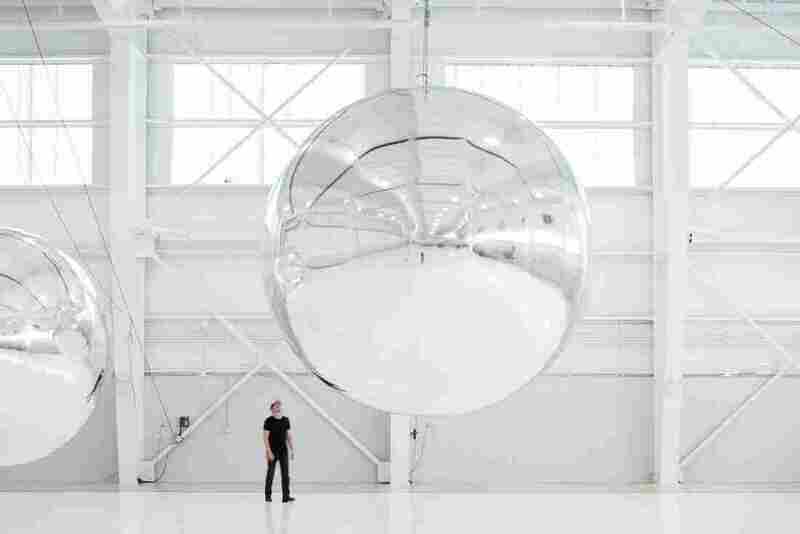 Lately, Trevor Paglen has been designing satellites that serve a purely aesthetic function — that is, without military or communications purposes. This draft is the "Prototype for a Nonfunctional Satellite (Design 4; Build 4)." Courtesy of Altman Siegel Gallery and Metro Pictures. Trevor Paglen writes the kinds of books that get you into weird conversations with strangers. He takes the kinds of pictures that are slightly unnerving until you read the title card, and then it becomes a regular amount of unnerving. He also just sent a giant inflatable mirror up into space. That last one is just the latest art piece in a career all about being watched by things you can't see. It's a topic that's interested Paglen since the early 2000s. He was thinking about the growth of the private prison system — how prisons used to be big, visible structures inside cities, and how they were now more often built in remote areas. Out of sight, out of mind. He was getting his Ph.D. in geography at the University of California, Berkeley, and he was spending a lot of looking at United States Geological Survey aerial images. While looking at these maps he'd find spots that were blank — edited out of the original negative. "When I was doing my dissertation research, it was really the middle of this emergent war on terror," Paglen says. "It was a moment when it was clear that the United States had set up a kind of secret architecture for warfare. I wanted to understand, if you were a state: How do you create places, or programs, or even people that 'don't exist'?" He'd publish that dissertation research as a book called Blank Spots on the Map: The Dark Geography of the Pentagon's Secret World. He wrote about booking hotel rooms in Las Vegas to photograph airplanes bringing people to and from work at secret military bases; about learning how to track secret satellites in the sky from online amateur communities; about climbing mountains and ridges with telescopes to see what military installations look like. State secrecy is a form of executive power. It is the power to unilaterally and legitimately conceal events, actions, budgets, programs, and plans from the legislature and public at large — the people who are paying for it. State secrecy is a form of monarchical power that contemporary states have inherited from the kingdoms of yesteryear. In our American system, state secrecy is the provenance of the executive branch; it has little statutory basis. It is a tool of kings. In the video projection "89 Landscapes," Paglen compiled his short films of intelligence facilities around the world, originally shot for the documentary Citizenfour. Courtesy of the artist and Metro Pictures, New York. Image courtesy of the artist; Metro Pictures, New York; Altman Siegel Gallery, San Francisco. That said, Trevor Paglen is having an extended moment in the public spotlight. There was that MacArthur Fellowship he won last year. He's been touring a performance around the world with the Kronos Quartet, a musical piece about computer vision and artificial intelligence. And this past summer, the Smithsonian American Art Museum in Washington, D.C. opened an exhibition of his art called "Trevor Paglen: Sites Unseen." It collects his grainy pictures of secret government buildings, printouts of redacted emails, military patches with symbols we don't know the meanings of. It's mundane stuff — maybe even boring — until you realize what you're looking at. For example, one set of photographs is just pictures of cables that run underwater. But they've got titles like "NSA-Tapped Undersea Cables, North Pacific Ocean," or "Bahamas Internet Cable System (BICS-1) NSA/GCHQ-Tapped Undersea Cable Atlantic Ocean." Another set of diptych images pairs a nautical chart indicating the locations of underseas communications cables (which Paglen has annotated with his own images) with a photograph of a shoreline where such cables land (and where they may be tapped). "NSA-Tapped Fiber Optic Cable Landing Site, Keawaula, Hawaii, United States 2016." The Metropolitan Museum of Art, New York, Purchase, Vital Projects Fund Inc. Gift, through Joyce and Robert Menschel, 2016. Image courtesy of the artist; Metro Pictures, New York; Altman Siegel Gallery, San Francisco. Kirsten Johnson is a documentary filmmaker and a friend of Paglen's. They worked together as cinematographers for Citizenfour, the Academy Award-winning documentary about NSA whistleblower Edward Snowden. She says that Paglen's work shows the edge "between what we can see and what is actively being hidden from us. Often by governments or military forces. And that edge is where we as citizens can try to investigate what governments want to hide from us." "It's not as if Trevor has any answers as to what we should do upon learning this information," Johnson says. "His work is not prescriptive. And for me, any artwork of value, is not prescriptive, and any documentary that tells you what to think isn't worth sitting through." Michael O'Hanlon isn't super familiar with Paglen's work, but he is a senior fellow at the Brookings Institution who specializes in national security policy, and was also on an external advisory board for the CIA. So what do people from his world think of a guy like Paglen? "I do think a lot of them would begin with a certain amount of nervousness once they hear the initial report on what this guy does," O'Hanlon says. "For the most part what he's doing is pretty interesting, within the First amendment, and even putting on my national security cap I had a hard time seeing how major damage could result." Paglen doesn't seem like he's out to cause major damage. He doesn't have any interest in getting arrested, and his work also doesn't explicitly state any arguments. "I'm very conscious about the legal environment that I'm in," says Paglen. "I kind of know where the literal and metaphorical boundaries are and I tend to stick within them." But he does want his art to call attention to these systems of surveillance. He talks a lot about how art can help people "see things differently," which might be coded art-speak for "see things how I see them." "When I'm walking through everyday life, I'm questioning things," Paglen says. "If a store asks me for a phone number, I'm thinking, 'Why do you want my phone number and what do you want to do with it? Are you going to sell it to somebody?' ... One sees the things that one pays attention to." 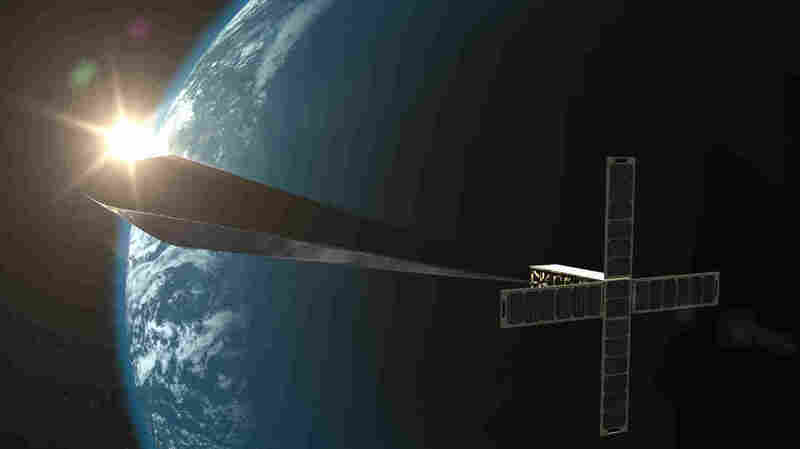 A conceptual rendering of "Trevor Paglen: Orbital Reflector, co-produced and presented by the Nevada Museum of Art." The final version of the nonfunctional satellite was just launched into space. That brings us to his new project: "Orbital Reflector." It's the nonfunctional satellite he's been working on with the Nevada Museum of Art, that, as of this past Monday, Dec. 3, is currently orbiting us in space. It's meant to reflect sunlight back down to Earth so we can easily spot it from the ground. It's about as bright as a star in the Big Dipper. Paglen says that the history of spaceflight is closely tied to the history of nuclear war — e.g., how Sputnik was a flex to show that sending a nuclear warhead across the world was possible. And "Orbital Reflector" is a speculative piece asking: What if that weren't the case? What if satellites were mainly aesthetically beautiful, and didn't exist to track climate patterns or field phone calls or follow military targets? Krystal Wilson is the director of space applications programs at the Secure World Foundation, a private group that promotes space sustainability. She appreciates that Paglen is getting people interested in what people are doing in space. "Whether this is the most effective way to do that or not, that's a question," Wilson says. Wilson says there have been other similar experiments (to the annoyance of some space-watchers), and that you can already see the International Space Station with the naked eye. And she points to the robust online community of amateur satellite trackers (that Paglen learned from) as evidence that you can already, with a little bit of know-how, see a satellite in the sky. "You have to know where to look for it," she says. "But essentially anyone can look up. There's no magic cloak." But that's true of most of Paglen's work. One could walk into the desert and find a nondescript government building, or use a telescope to spot a surveillance drone, or swim underwater and look at tapped Internet cables. They're hiding in plain sight. Paglen says he knows his art won't change how we use these technologies. "What I can do is just ask people to literally look at the sky," he says.